Hi! 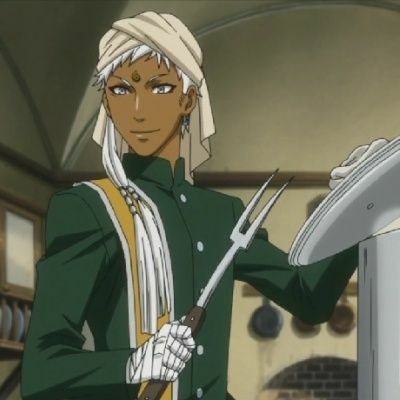 I'm currently making my first anime cosplay for this summer's anime con in my city, and I am doing Agni from Black Butler, while my friend is cosplaying as Soma! This is, however, my first huge cosplay project. The other cosplays I've done have been rather simple since I could just find shirts and pants at thrift stores or whatever. For Agni, however, I'm sewing his coat and sash/belt by hand (and by hand, I mean by machine. ), and am making his head wrap thing. I will also be buying a white wig and white hair extensions for the wig. I will post pictures of the cosplay with both me and my friend once we have them complete! But first... well, I need some pro tips from you guys!!! 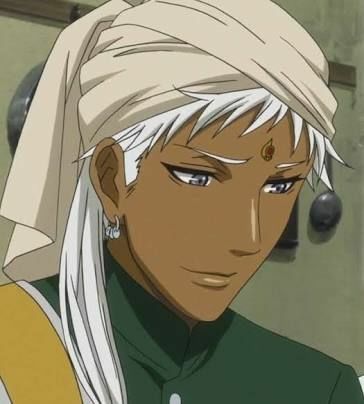 ^-^ I have been looking everywhere, and I have NO FRIKKIN CLUE HOW TO MAKE HIS HEAD WRAP. I SWEAR. I have some material, but I don't know if I'm supposed to cut it, how big it's supposed to be, etc. And even past that, I have no idea how to actually wrap it around my head!!! >.< Apparently, Agni is not the guy everyone wants to cosplay as. ;_; Poor guy. And those who do cosplay as him aren't the types to say HOW they cosplayed as him, so I have no idea how to do his head wrap!!! Thoughts on his head wrap? Has anyone cosplayed as him and know how to do it? Or can any of you pros figure it out by looking at his pics? Thank you in advance, and I look forward to making and wearing this cosplay!! Could you post a reference picture to see exactly what is the headband? I'm sure there must be sewing patterns for it! I think I tried to, but couldn't for some reason... but, well... here's a go at it! Most Indian head coverings that I'm seeing don't have the little train in the back... or any train anywhere on the head. I could just get some fabric and experiment... at this point, that's all I can do... Google-sensei has failed me. The headpiece is a turban! It's a traditionnal cloth in India. It's a long rectangular piece of fabric carefully put around the head. There are lots of tutorials on google. - use a base (worbla? foam? hat?) that can be put in top of the wig. You can glue the fabric on it so you won't take hours installing the turban at conventions. I hope it will be useful for you! Thank you so much!!!! ^-^ I'm starting work on our costumes with my friend this week, and the convention is July 8-10, so I'll have pics by then!!! Thanks for your help, Corycaly-sempai!!! I'm happy to have helped you. I hope my ideas will work for your project!